Food Foundry is a cosy family restaurant, situated in the leafy suburb of Section 17, Petaling Jaya. 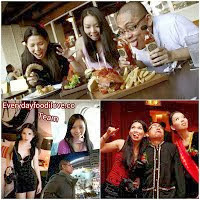 Serving addictive-free Asian and Western meals, including their popular chicken cordon bleu and hearty pastas. There’s also a selection of salads, meat, poultry and fish dishes. Food Foundry also has a selection of new desserts, including the creamy almond tiramisu and homey bread and butter pudding. Don’t leave without trying their cakes: The mille crepe and moist chocolate cake are highly recommended. If you have a birthday coming up, they can bake you a cake for the occasion. Just place your order at Tel: 603-7955 3885 three days before the date you need your cake. Catering and functions services also available! Mille crepe, which literally means a thousand layers of crepe, is actually a cake comprising about 30 smooth, light layers of crepe with fresh cream between each layer. It’s melt-in-your-mouth good, not too sweet, incredibly light and extremely addictive. Made fresh daily, with ingredients of the highest possible quality, the cake comes in three flavours. The original is made with fresh vanilla pods for a rich flavour; the chocolate mille crepe has a velvety texture and a bitter-sweet taste that true chocolate lovers will revel in; and the strawberries and cream flavour features thick jam and strawberry pieces sandwiched between layers of crepe and the original vanilla cream. So, whatever your tickles your taste buds, we have it, sliced and ready to serve. Mille crepe is French, but the Japanese are very fond of it. Aren’t you lucky that you only have to go as far as Petaling Jaya to enjoy a slice? And, by the way, whole cakes are also available so, yes, spoiling yourself silly just became a whole lot easier. Drop in soon for your slice of mille crepe that bring you to paradise!!! Food Foundry Hari Raya Special!! !